This is a proposal for a future project that I am interested in experimenting with. The photo above shows a tube with three radio coils mounted on opposing sides of it. At some point I would kine to test to see if this could be used to increase the clarity of a detected radio signal by averaging them together, locate the direction that the signal is coming from, and process multiple radio signals simultaneously. I have been referring to this device as the radio module and besides receiving signals like the model shown above will be able to do I also want it to be able to act as a transmitter. On the other hand the receiver will be sensitive not just AM and FM radio frequencies but also the radio signals from radio remote controls and other devices that produce radio waves. The radio module will plug into the robots computer to scan and analyze signals as well as being able to recognize and ignore unwanted ones. The capabilities of this system would be excellent for an autonomous robot because it would allow the robot to communicate with any other device since all wireless technology operates using radio frequencies. Dive into this project's history. See the latest advances and updates. 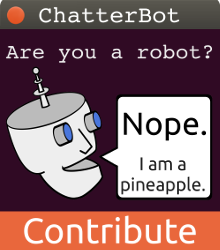 Machine learning makes it possible for this python library to reply to users and learn based on past conversations.